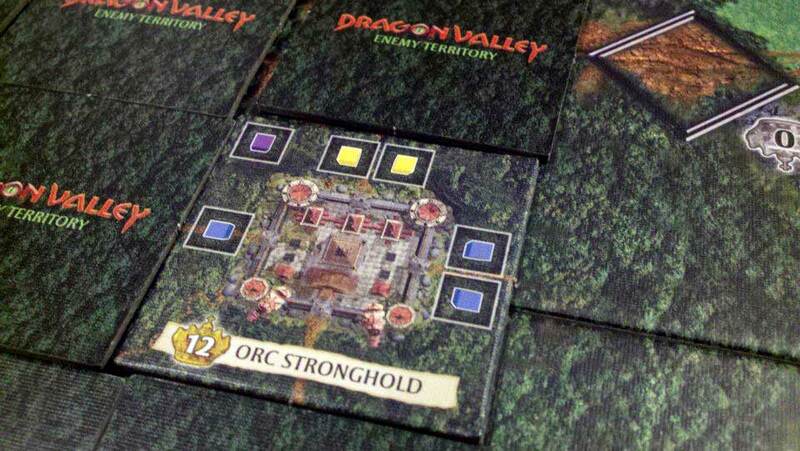 Not so many years ago, a great war for the crystal rich mountains of Dragon Valley raged. Dragons and orcs overran the defenses of the fledgling Kingdom of Corundia, a human civilization bent on mining the ever-so-important crystals. The nobles who lorded over the populace of Corundia fell in a series of great battles. With no local leadership, the countryside had no defenses against the creatures attacking from the mountain passes, the doorways to Dragon Valley. Lacking an heir to his throne, the king sent Storie, his trusted friend and a skilled alchemist, in search of the Quintem, a powerful crystal rumored to be able to call great leaders in the time of great need. This is that time. Finding the Quintem and bringing it back to King Trician’s castle, Storie was able to activate the great power within. A mystical glow of sapphire, ruby, emerald and amber colors covered the great hall. You, along with the other bearers of the four Great Corun Crystals were magically summoned to the court of King Trician. Without a way home and no armies of your own, you have each agreed to lead the defenses of the mountain passes in exchange for lands and the title of Baron. Now you must prove your prowess and leadership in order to become the heir to the King of Corundia. 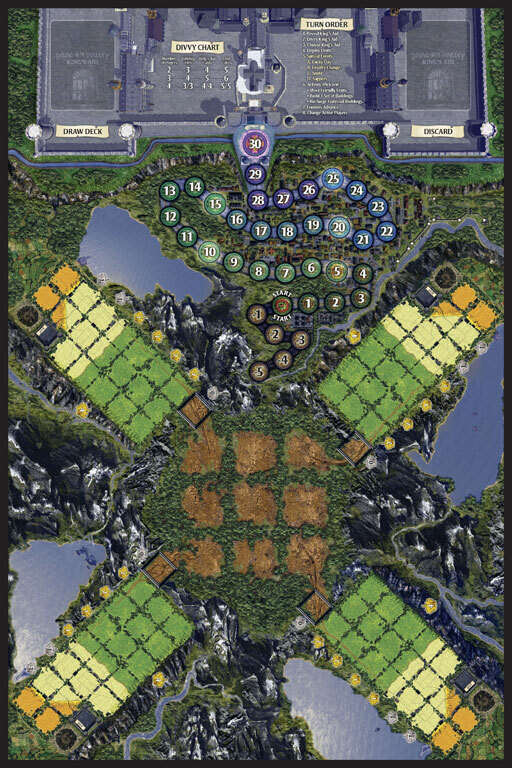 The goal in Dragon Valley is to have the highest score after one or more players reach 30 or more points at the end of a round. Players score points in a variety of ways. 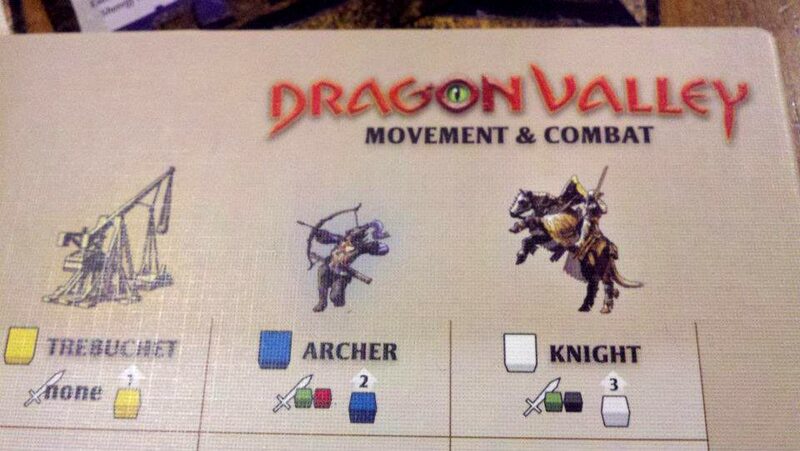 One method uses knights, archers and towers to destroy battering rams, orcs and dragons as close to the mountain passes as possible. Another way to score is to build moats, walls and arc jewels which block the movements of those enemy units, directing them off of a cliff for points. 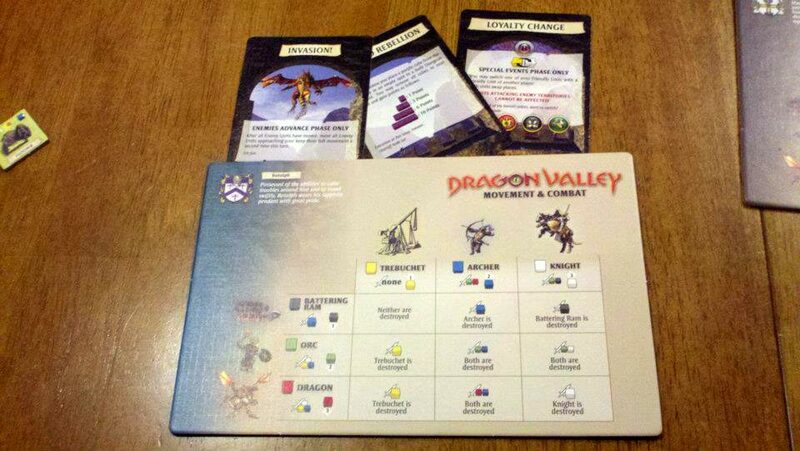 A third scoring strategy uses trebuchets along with knights and archers to lay siege and conquer enemy territories in the middle of Dragon Valley. 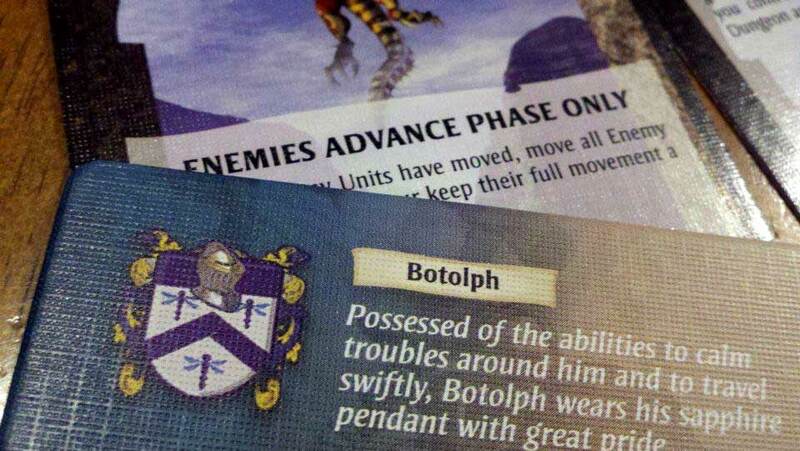 One player reveals buildings, friendly and enemy units and special event cards. That player divides the items into "equal" piles and the remaining players each select a pile. The person who divided the piles gets the remaining pile. Players then take their turns dealing with the good and bad items that they received. Points are scored for destroying enemy monster units and successfully completing a siege on enemy territories. 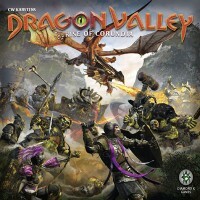 Add a Review for "Dragon Valley"